From a 50cc scooter seat to the latest super-bikes. We have a vast selection of materials to cover your bike seat. 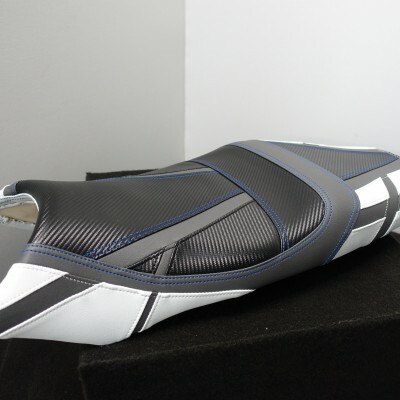 Our skilled trimmers have experience filling a wide rage of bespoke motorcycle seating so if you’re looking to give your motorbike a new upholstery then please contact us for further information. Please see case studies below to see the excellent repairs our trimmers have done previously. A simple design sometimes comes out looking even more powerful than a complicated one ever could. Black leather with red stitching around the seams. Chopper seat in Black PU with small square quilted centres stitched in orange. Twin stitched to side 6mm in orange thread. Unfortunately we didn't take a before photo. Honda motobike seat re-trim in black and white tekko. Unfortunately we do not have a before image of this re-trim. Re-trimmed in black PU with bright blue insert and stitching. Honda bike seat re-trimmed in red vinyl. BMW GS1200 re-trimmed in Black and Grey PU with grey stitching. Triumph motorbike seat re-trimmed in black tekko with orange teKKo insert and orange stitching. Unfortunately we do not have a before image for this re-trim. Yamaha motorbike seat re-trimmed in black PU with grey stitching.